Let’s see here. What’s changed since the last time I wrote? We had a great, prolonged visit from my inlaws, Granna and Pa (Ami calls them Geeka and Pa, or often her own portmanteau GeekaPa). Ami has had TWO stomach bugs, one of which poor Geeka caught while they were in town. We created a toddler play room in a corner of our dining room, which is SUPER awesome, and because of it we’ve been having more people over to play. Ami is speaking more and more in two-word sentences. We’ve even caught the occasional attempt at putting three words together. She’s a little mimic, and it’s really funny to hear her say “hmmm” in the exact tone I use. And we’re getting ready for school! Her first day at preschool is Tuesday. She’ll be going two days a week for four hours. I can tell she’s ready. In the last couple of months, she’s shown much more interest in other children and is clearly wanting to interact with them. I’m excited for her, but I’m definitely a little nervous. There’s going to be a whole part of her life now that is outside of me and outside of the house! It’s another step towards her being an autonomous, independent person, and boy is that a weird feeling for little ol’ mama over here. This time, I’d like to write a day in the life post about a terrific weekend day, Saturday 8/27/16. Ami turned 21 months on 8/25. Three months until the big 0-2! 5:30: Crying from Ami’s room. Crap. By the time I roll over to poke Logan, though, she’s stopped. Huh. 6:50: Crying again. This time it doesn’t stop after a few seconds. Logan goes to get her and she nurses for 45 minutes. She falls asleep for another 30 minutes or so. Then she’s up, jumping, repeating “diapow?”. Logan gets up to change her diaper and I get a bit of time to gather myself. 8:30: Breakfast! Logan made scrambled eggs and toasted English muffins. Ami is into the eggs this morning. I’m thankful her appetite is coming back – two stomach bugs in a row mean she really hasn’t eaten much over the last few weeks. After breakfast, Logan and I take turns getting dressed. He gets Ami dressed while I pack a snack. 10:00 we leave for Jump USA! 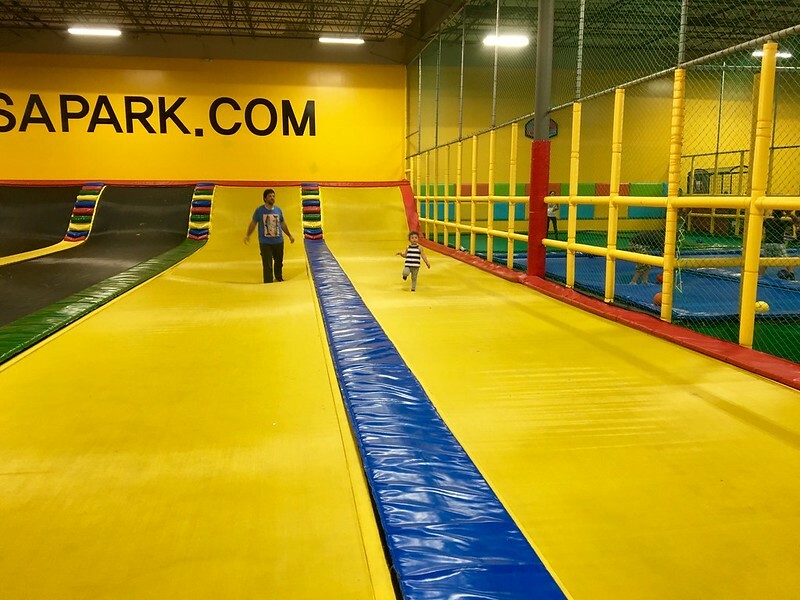 This is a trampoline facility that my friend Alison recommended. Her toddler loves it, and Logan has been really wanting to go. It’s going to be difficult to extricate her from Jump USA, but at 11:45 we decide to try. Sure enough, there’s crying and anger, so I get down with her and make an offer: how about the three of us jump our way out? Offer accepted, so we slowly make our way to the door. After a little more negotiation, we all get in the car and drive up the road to Pho Saigon. This turns out to be an inspired choice for lunch with a toddler. There’s no wait, and our food is on the table within 5 minutes of ordering. 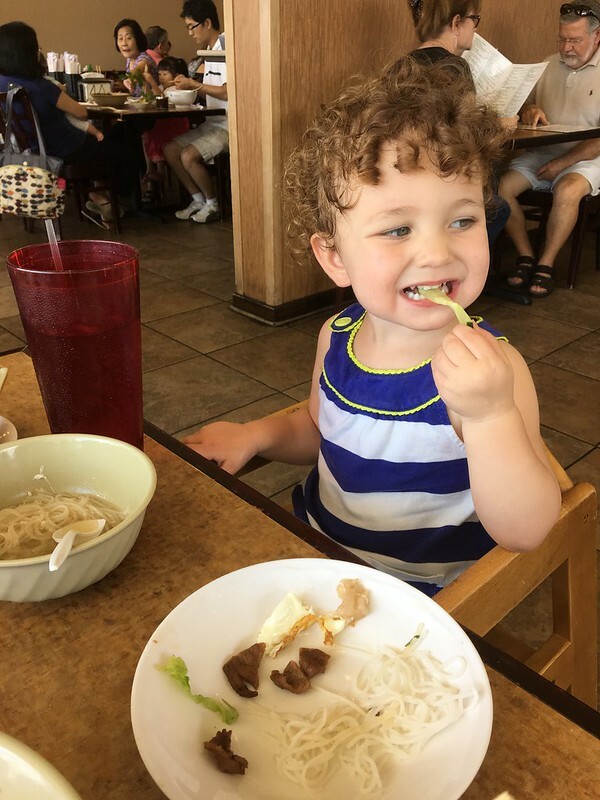 Ami likes my noodles, char broiled pork, and egg roll, and she’s also a big fan of the broth from Logan’s soup. She’s getting really good at using a spoon when she wants! After lunch, we pile into the car again to head home. The drive back to our place only takes about 10 minutes, which is lucky because Ami almost falls asleep as we are pulling into the driveway. We get her inside, and Logan changes her diaper. I lay down to nurse her to sleep. Since she started climbing out of the crib a month ago (AUGH) she now naps in the daybed in her room. At night, she’s either in the daybed or in her crib, which Logan’s folks converted into a toddler bed by sawing out a few of the slats. 1:35 she’s asleep! I run a comb through my hair and head out the door to get my hair cut. I’m seriously overdue! I get home at 3:15. Logan tells me that she woke up at 3 and got out of bed to explore the house. When she couldn’t find me she started crying. Logan got her and explained that I would be back soon, so she went back into her room and laid down (?!?). 3:30 I hear her calling for us. Logan gets her and when he brings her out into the living room she breaks into a huge smile. She asks to nurse, but I’m in the middle of updating the family calendar, so Logan brings her into the kitchen and gives her a snack while I finish up. Then she nurses for a little bit on the couch while we watch the sea turtle scene in Finding Nemo. While Ami was sick, she ramped WAY up with the nursing again. For almost three days, she didn’t/couldn’t eat anything and only nursed. Since she’s been feeling better, I’ve been trying to dial back. It was pretty overwhelming for me, having a toddler who wanted to nurse like a newborn! At about 4:00, we get in the car to drive up to Baby Earth. I am extra excited about this errand. 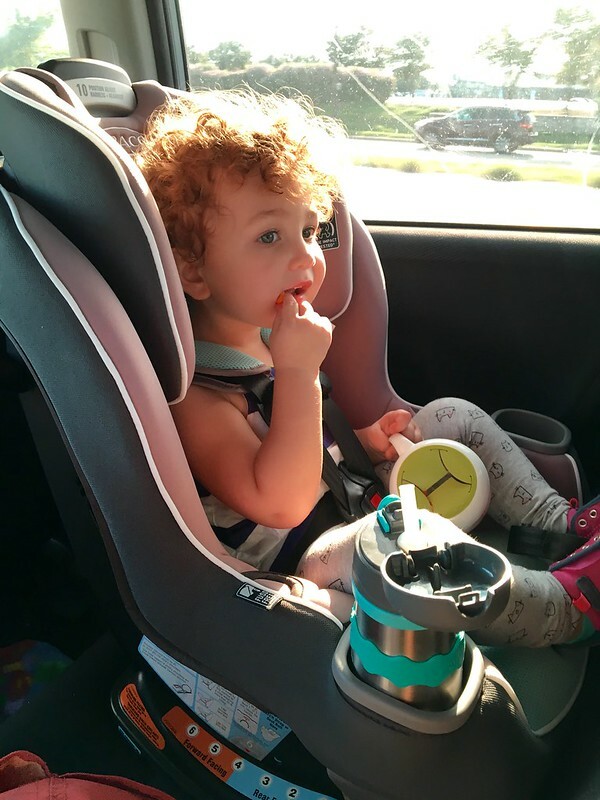 Ami has outgrown her car seat, and we’re going to get her a new one! I’ve been researching and have narrowed down to four seats, and we’re going to go look at them all. 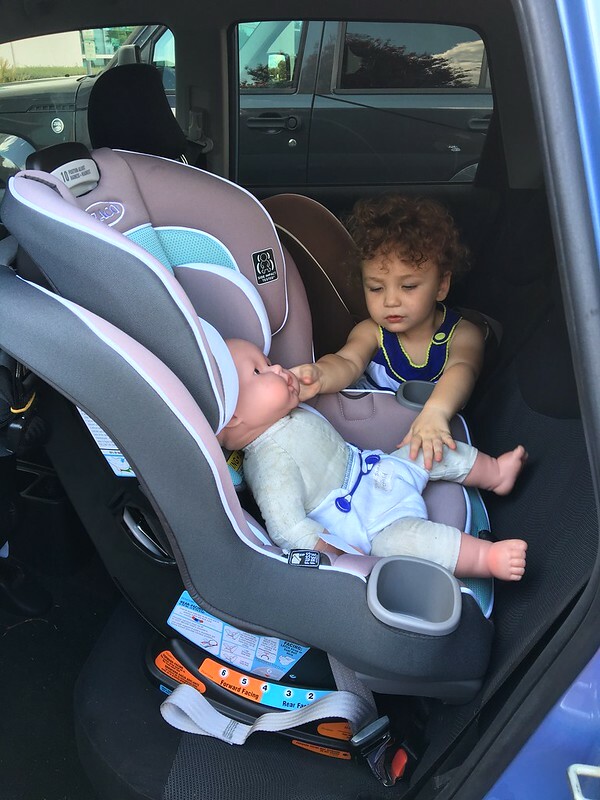 Baby Earth has a car seat tech on staff, which is great. We talk through our options and pick a seat we really like. It fits in our car, they have a color we like, and they’ll cut us a deal. WOOHOO! We walk out the door with a brand new Graco Extend2Fit in the Spire colorway, and hopefully I won’t have to think about car seats again for a good long while. Eek, somehow it’s 6:00! Ami is seriously hungry on the drive home, so I let her have goldfish crackers in her brand-new seat. I’m excited about the cupholders, and that she sits up higher now and can see out the window. We get home around 6:30 and Ami is still fussy and hungry. I give in and nurse while Logan works on dinner. 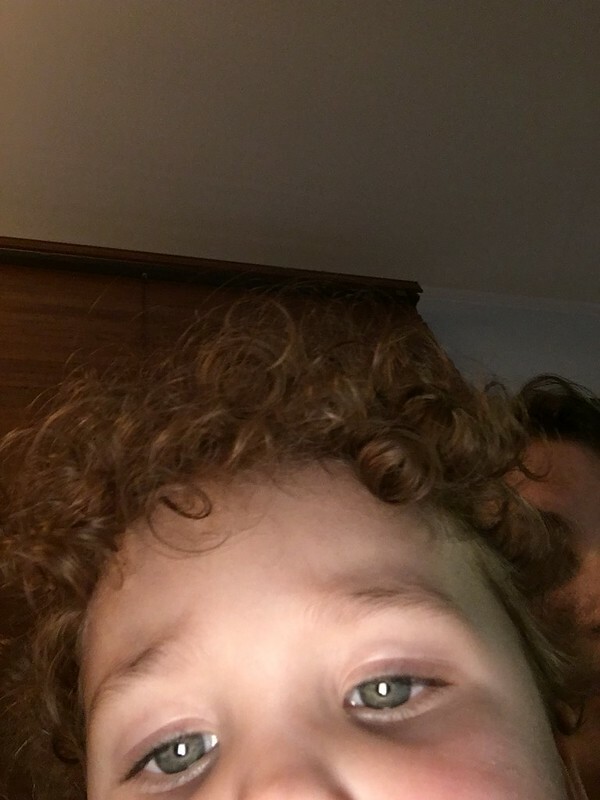 We also send selfies to auntie Ellen. 8:15 bath! I clean the kitchen while Logan gives Ami her bath, brushes her teeth, and gets her into her jammies (tonight, she wants to wear the ones with puppies). She’s super tired. About a month ago, we changed up her bedtime routine, so after she gets her pajamas on, I go in to nurse her. We talk about the day, especially the fun we had at the trampoline place. She’s almost falling asleep, so we go get Logan for her bedtime book. Tonight, they don’t even make it through one book before she is saying “night-night!” and pointing at the bed. Logan sets her up in the day bed with a little blanket and her soft stuffed puppy. She says “night-night, bye-bye!” to him, he sings to her for a minute, and then he leaves at 9:05. We don’t have a video monitor, so I can’t be sure if she immediately went to sleep, but she’s totally quiet. Moving around the bedtime routine has really been wonderful for all of us. She’s falling asleep on her own in her bed now, which is a HUGE step for us, and I’m not having to do this nurse-wrestle thing with her for 45-60 minutes every night until she falls asleep. Logan watches the Guy Ritchie Man from U.N.C.L.E. while I read a bit of my book for my mom’s group book club next week (Becoming Brilliant). We head to bed a little after 11, still hearing nothing from Ami’s room. And she doesn’t call for us until 7:50 this morning. It’s not like this every night, but if you’d told me six months ago, or even two months ago, that our girl would put herself to sleep in her room and sleep for almost 11 hours straight, I would have laughed at you and then cried at your cruel joke. Wonderful! Great, descriptive writing too. And pre-dinner texting with Amity was a highlight for me, too.